Are there any side effects when using Emvelo? Emvelo Products have shown no harmful side effects, only positive spin-offs for the environment. How will I know if Emvelo is working? The products are all brewed using environmental “best practice” and sustainable resources. The brewing process is safe, non toxic and non corrosive. 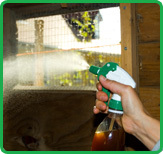 Using the sprays has shown to provide sweeter smelling animal housing areas with low biological oxygen demand (BOD) and reduced ammonia levels. What about impact of using medication? Experience in the field has demonstrated less reliance on pesticides, antibiotics and chemicals when the products are used on a regular basis. However, we would still recommend you speak with your vet regarding any health issues with your animals or birds.